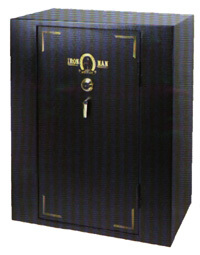 **Our Security Locking System was designed in cooperation with America's leading manufacturer of UL (Underwriters Laboratory approved) high security safes for use by business and financial institutions. 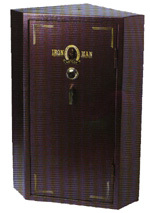 IRON MAN gun safes offer all the above-plus more! Superior protection against burglary for your guns and other valuables. Burglars take more than TV's, stereos and jewelery. they take things you can't replace. No amount of insurance can replace something like grandpa's old rifle or pocket watch. Your personal fight against crime. Criminals regularly use weapons stolen from law abiding citizens in violent crimes, and it's time we put a stop to it. That's one good reason why we take extra care in designing and building each and every safe. The polished brass plated dial, dial ring and door handle add a rich look to what will become a showpiece in your home. The treasure chest model comes with a seat cushion covered in black naugahyde to disguise it as a bench seat. A single layer of fire lining is furnished with this model. Our Unique Corner Models (pictured top right) give you the flexibility to place the safe so the door is at a forty-five degree angle to the walls, while maximizing the use of an awkward corner space in your room. So, what are you looking for in a gun safe? You'll find what you want - and more - in our gun safes. We know that you'll agree that you won't find a better value in any other gun safe.